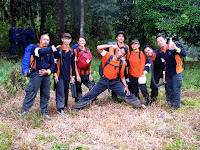 Recently I was involved with the X-Kenyir. In case you haven't figured it out, it stands for "Exercise Kenyir". 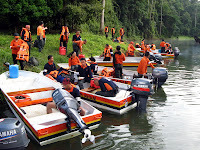 It was the brainchild of the Director General of the Malaysian Civil Defence Force. There were 3 phase that the teams have to complete. 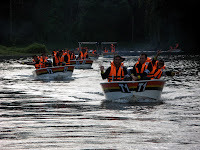 The teams must depart from base camp and head for Sg Cicir by speedboat. The journey takes about 1.5 hours. 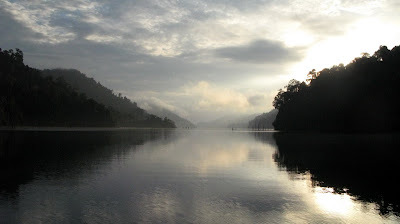 Upon arrival, teams must hike up the Gunung and camp for the night. The next day, they have to trek back down and head back to base camp. 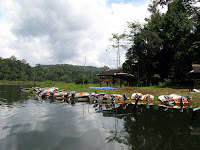 Teams must depart from from base camp and head for Gua Bewah. The journey takes about 2 hours. Teams must complete 2 sections. Section 1 is where the team must rappel down about 100 ft, administer first aid and secure the victim, and then hoist up the victim including all team members. Section 2 is where the team members conduct search & rescue (SAR) in the cave itself, locate the 5 victims, administer first aid and evacuate them. Teams must complete 2 sections. Section 1 is where the 'rescuer' must throw a life line 25m to a victim and succesfully conduct a water rescue. Section 2 is where the 'rescuer' must enter the water and swim 50m to the victim and do a chest tow back to shore. The competition is by zone, namely the Northern, Central, Southern, Eastern and West Malaysia. The first place went to Eastern. Best leader award went to Lt (PA) Zabri from Terengganu. Where was I amidst all these events? I was there on the rescue boat, part of the water rescue dive team. 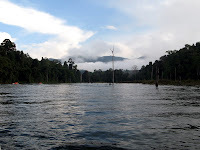 I went diving 3 times while I was in Kenyir. Collected some 'kupang' about the size of a boy's palm which was in abundance (because no one crazy enough to dive there kot). I came face to face with an ikan toman (snake head), medium size. As I was just wearing my lycra shorts and without a dive knife, I was afraid that the sight of my exposed thighs were just too tempting to the ikan toman. It just stared at me without any sign of backing off. Since I was in his terratory, I bowed out. Learn to respect other life forms...human or otherwise.